Contestants in the first tennis tournament, 1886. Tennis arrived at Vassar in 1879, only five years after its introduction to the United States in 1874. It immediately became popular, diverting attention from most other outdoor sports. Although the girls initially showed "more energy than grace in playing," by 1891 they had organized a club. Unfortunately, the club appears to have had no rules about how to properly care for its equipment. The members tended to leave the rackets and balls out overnight, or in the rain. This, combined with an absence of proper training and knowledge of the game’s rules, made its popularity dwindle rather quickly. 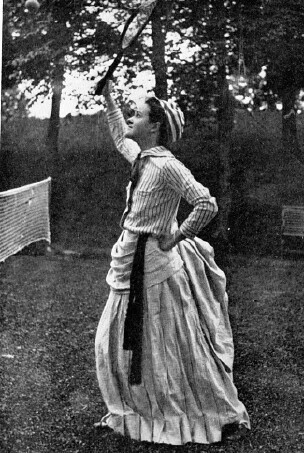 However, Alice McKinley of the class of 1888, determined to revive enthusiasm for the game, decided in 1886 to hold a tennis tournament. She managed to collect four sets of doubles and six singles players and entered both events herself. Apparently, "The playing began at 8:30 and lasted until gold medals of dainty design were awarded the victors at 6 pm. Alice won the singles. Towards the end of the doubles, her partner was so exhausted that, except when the rules necessitated her receiving, she sat in a corner on her racket. In spite of her, the energetic Alice won the doubles, having played 13 sets that day. After this first tournament the faculty decreed that no girl should enter both singles and doubles and no trophy of intrinsic value should be given to the victor." In the wake of her triumph, Alice, clearly a player with skill, became president of the tennis club. She reorganized it with a "greens committee," responsible for caring for the equipment. Originally, they played in the Athletic Circle, now Noyes Circle. 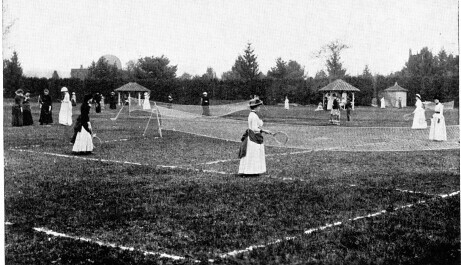 When field hockey took over the circle in 1902, tennis relocated to its first clay courts, situated where Cushing currently stands. In 1926 with the construction of Cushing, tennis moved to the courts by Josselyn, where it remains today. Originally, the lady principal and the college physician limited both those permitted to join the tennis club and the number of competitions the club could organize. In 1892, the college allowed the students to hold another tournament with a racket as the prize. 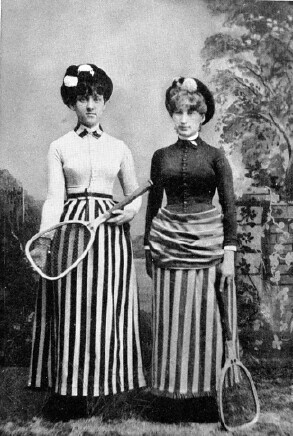 However, when Bryn Mawr challenged the Vassar tennis club to a match in 1894, the college refused to let the club play. As one student saw it, the faculty told them to "run out in the garden, children, and play ball with one another nicely" instead. This decision temporarily decreased interest in tennis until the club was reestablished in 1896 under the auspices of the Athletic Association. By the 1920's, the tennis team was competing somewhat regularly with other women’s teams in the area. Throughout its history, tennis has remained one of the most popular and successful sports at Vassar. The fact that it owes its existence to a girl who could defeat a team of doubles playing as a single was in many ways appropriate to its future success. "Athletics," Subject File 23.92-94, Special Collections, Vassar College Archives. Ballintine, Harriet. "Sports in Vassar College" compiled from "The History of Athletics by M. Litchfield and M. Mallon," Vassar Miscellany News. October 1915. "Physical Education," Boxes 1-4, Special Collections, Vassar College Archives.